Avon's Refer a Friend Program - What's in it for You? When you visit my online store, you are probably thinking of a particular product that you want to order, or perhaps you are wanting to look at The Book to see what's new and what's on sale. Because time is always a valuable commodity, you may never take a few moments to look around the website to see what else is available. For this reason, I'm going to be writing a blog now and then to bring some of the other amazing features you will find at that location to your attention, such as the Avon Blog, the How-To's, the Avon Causes, and this one today on the Refer a Friend Program. store, you will see this box pop up giving you three choices of ways to refer your friend. If you click the "Share via Facebook" button, you will be taken to your FB profile page and see this box open up so that you can say something wonderful about Avon products or your Avon Representative 😁 and then post the image. Win/Win/Win since I win, too! Yay! Everybody wins!!! You can also choose to share via email or by link which can be copied and posted anywhere links can be posted. Ready to give it a try? Just go here, click the link on the top right of the page, and earn your 10% off coupon today! *If you are accessing my online store from your phone, you may not see Refer a Friend at the top of the page, but you should see a hot pink circle with "Get 10% Off". Tapping that circle will take you to the same offer. Here I am, team, right on schedule! I had my last follow up visit with my doctor post-surgery and everything is going great. Maybe I'll stay on top of things for awhile now. I'm posting the top 4 in sales in the current cycle because my reports from Avon show that the only Cloud Climber Tracking for President's Club is Margo Prytz, but Rene Parker and Leslie Clendenon now have higher cycle to date sales than Margo, so I'm going to say that they are all tracking for PC. Keep up the great work, ladies! New to the Cloud Climbers: Congratulations to Rene Parker for adding Cynthia Fichterof Laceys Spring, Alabama, to her team! Welcome to Avon, Cynthia, and to our team. Birthdays for April: Hattie Bush (4/1), Nicole Darby (4/3), Ruth Basile (4/11), April Hesterley (4/25), and Lisa Anderson (4/30). Avon Anniversaries for April: Gladys Faulk (29 years on 4/4), Thelma Mast (37 years on 4/6), Sandra Moore (32 years on 4/10), Kristi Strode (3 years on 4/15), Kim Mitchell (3 years on 4/22), and Margaret McCrary (4 years on 4/30). Congratulations to all these hard working Avon Reps, especially those who have been dedicated to their businesses for more than 25 years! Challenge: If you read the last Newsletter, you know that I have begun to include a challenge in each Newsletter. I'm also posting the challenge on our Facebook Group page. I told you that I would accept the challenge each time as well, since I will not ask you to do anything that I won't do. One of the rules for the Challenge is that we must have at least 8 participants (less than 10% of our team) in order to do a drawing for a goodie package from me. Well...Deanna Buswell was the only Cloud Climber, (besides myself), who accepted the challenge in the last Newsletter, so we were not able to do a drawing and Deanna's name will be in the Challenge Can (seen in the attached pictures) twice for the new challenge. I say it will be in the can twice because I know Deanna well enough to know she will accept this new challenge, too! I'm going to make this one super easy and something that everyone can do without stepping out of their comfort zone. Challenge: You must go to Avon U and take one course that you have not taken before and let me know as soon as you have completed the course. If, wonder of wonders, you have taken every course available, just let me know and I will put your name in the Challenge Can as well. I don't think I have to worry about that, though, because there are still plenty of courses that I need to take and I feel certain that the same is true for each of you. You have until the end of Campaign 9 (Tuesday, April 16, at 5:00 p.m.) to complete the challenge. I'm off to complete my other Saturday tasks. Have a great weekend, and let me know if I can help you in any way. I'm praying for you and your business! Notice that in the heading I said "book" rather than "brochure". 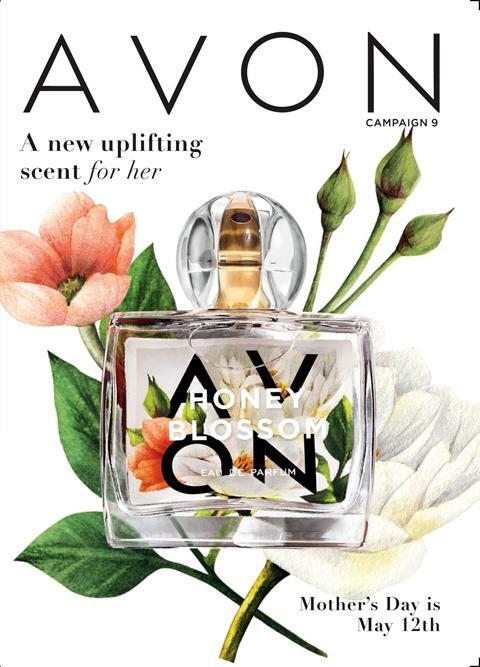 I'm trying to get used to using that terminology more, since Avon now has "The Book" as the heading to look for at my online store if you want to look at the Avon brochure (as it has been known for years) online. :) This book is over 200 pages long, so there are MANY more great buys than these, including some terrific Mother's Day gifts! Pgs. 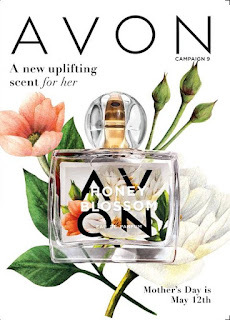 4/5, Avon Flourish Honey Blossom Eau de Parfum is a bright floral scent that is perfect for Spring, with a bottle that is gorgeous from the front and back. It is $15.99 at intro price and there is a scent spot on pg. 5. Pg. 9, For deep and lasting hydration, get any 2 Anew Hydra Fusion products for $35 AND get a FREE Micellar Water. That's a total savings of $59!! Pgs. 12/13, Individual Sheet Masks to brighten, smooth, or calm your skin for only $2.99 each. Pg. 25, Limited Edition Iconic Avon Lipstick in three shades (Pink Blossom, Rose Shine, and Natural Shimmer) that mom will love with charming cases to match for only $6.99. Pg. 26, If lip balms are more your style than lipsticks, Avon has dressed up Flavor Savers for Spring and you can get Strawberry, Melon, or Peach for only $1.49 each. Love that black check! Pg. 33, Beautifully packaged gift sets for mom in Velvet ($30) and Haiku ($20). Pg. 77, Black Suede and Wild Country - two of our most popular fragrances for men - are $8.99 each. Pgs. 94-99, All Foundations, Powders, and Blushes are on sale individually (no need to buy two!) this campaign. Pg. 113, Woo hoo! My favorite Skin Care Deal is back!! You get the full regimen of either Anew Ultimate or Anew Platinum PLUS the matching cleanser FREE for only $55! Pgs. 134/135, The bugs are coming - are you ready for them? All Bug Guard items are on sale, including America's #1 Deet-free Repellent, Bug Guard Plus Picaridin. Pg. 141, WOW DEAL - SSS Bonus-Size Body Lotion with pump is only $9.99 and available in 4 wonderful formulas. Pg. 211, The A Box is a Pamper Party, so be kind to yourself with three skin care products and an A-Box Exclusive Pendant Necklace for only $10 with your $40 purchase. Have a great week! If you would like to be added to my Facebook customer group, please let me know. I do a few extra things for my customers there and we are able to interact, ask questions, share recommendations, etc. We are excited about a new, easier than ever, way to become an Avon Representative - with a FREE gift valued at over $80 just as soon as you self-appoint yourself here! You can read all about it here or at the "Become an Avon Representative" tab at the top of this page. There is a one-time $30 sign up fee that gets you a business for life (or for as long as you choose). You choose a free gift from the three options pictured below. You register your account at the website given. You are ready to start saving and earning money! I am notified that you have started your business so I can welcome you to my team of Cloud Climbers. Your free gift arrives and you start enjoying your Avon products! !